Sold by Atlantic Publishers and Distributors (4.6 out of 5 | 2,568 ratings) and Fulfilled by Amazon. Gift-wrap available. This book is an exploration of the Node.js platform. It begins by explaining what Node.js is, where it is used, and how it used. The next part of this book is an exploration of how to set up the environment for using Node.js. The prerequisites for you to use this platform are discussed and how to prepare them on various operating systems. Global objects, which are a common feature in Node.js, are discussed in detail; thus, you will learn how to use them. Utility modules are also explored. The web module in Node.js is explored in detail; thus, you will learn how to create a server and a client through use of this module. You will also learn how to send requests to a server and have a response relayed to the client. The REPL (Read-Eval-Print Loop) terminal is discussed in detail. You will learn how to perform mathematical expressions and declaration of variables on the terminal. The execution of multiline expressions on the REPL terminal is explored. You might need to scale your Node.js application. This book will guide you through doing this. Streams, the RESTful API, and events in Node.js are discussed. Sometimes, the files for your Node.js project might be located separately in a particular directory. This book will guide you on how to package these files together. Download your copy of " Node.JS. " by scrolling up and clicking "Buy Now With 1-Click" button. Start reading NODE. JS on your Kindle in under a minute. It seems that the author named "i" into "j", but forget to change the file name "support.js" to "file1.js"???!!! Besides, the codes listed in this book are all central aligned on Kindle, it is very hard to read. My friend told me about this flatform so I decided to read this book for a better understanding. This book is really informative. I suppose those who are looking for some neat and precise instructions to master Node.js will love this book like I do. This contains the details from installing it into your devices to the codes, syntax, commands to use for specific purposes. Actually I have not tried all those codes but all the ones I tried worked well. To the author, thank you for the book! This is actually a great reference if you are new to Node JS. Usually, programming is very hard and takes years before you could really master it. 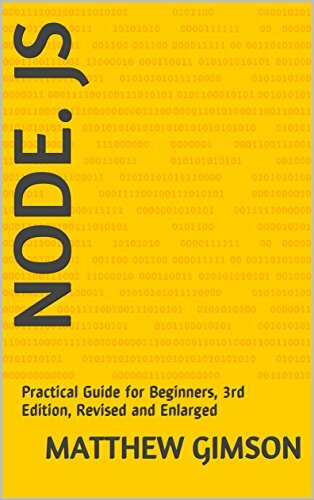 For some, like me for example, who only had very few knowledge about Node, this is a great book for us to understand what Node JS is, what it does, how to install it, etc. Again, a book I picked up in the promo for my tech and math loving brother. He loves the new pallet of skills to work with and I've mainly seen him sitting behind his computer with this book and some weird coding thing open. He said he's halfway and learning a lot of new things and im happy for that! 5.0 out of 5 starsExcellent ! 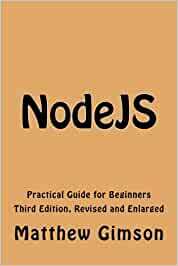 I must admit that programming is kind of a hard task or difficult to comprehend on my end, I get a copy of this book hoping to at least learn some basics about NODE..The content allow me to understand NODE wherein develop my skills to easily build network application. The book was well-written which also consist of precise demonstration and examples, from here we will able to learn how to program its modules to create a great file. Excellent !